Pita breads are stuffed with crunchy Greek salad, baby spinach, and a quick and easy kalamata olive tapenade for a healthy light supper or lunch. Once upon a time, before I moved from Calfornia to Missouri and became a clueless farmgirl, I worked as a freelance graphic designer. Many of my clients were restaurants, so I created a lot of logos, menus, and various promotional materials. The work was challenging and mostly pretty fun, and it's always nice working for businesses that serve food, especially if you're not actually working at them, which is something I also spent a lot of time doing. One of my long time clients was a cavernous micro brewery that offered an extensive menu of homemade pub fare, including some of the best beer-battered fish and chips I've ever tasted. The menus were handwritten in fairly small letters by yours truly (because the owner liked my writing) and printed on 11"x17" sheets of very bright yellow paper (because the owner also liked bright yellow, and sometimes there's no arguing with the client). I still have a laminated copy of one around here somewhere. The owner, who ended up becoming a good friend (which meant I got to drink a lot of free beer while perfecting my dart game) used to joke that they really only served a couple of items; they just rearranged ingredients and turned them into lots of different dishes. That's not necessarily a bad thing—and the other day I realized it's pretty much how I operate in summer. You take cucumbers and tomatoes, add various other ingredients, and serve them up all season long. For instance, if you add feta cheese, kalamata olives, red onion, oregano, and pan-fried croutons to your cucumbers and tomatoes, you have Greek Style Panzanella Salad, which I love so much I even eat it for breakfast. Swap out the oregano and red onion for some fresh basil, mint, parsley and scallions, then toss in some garbanzo beans and pita bread, and you've got Middle Eastern Vegetable Salad (Fattoush), which is really good even without the pita. Whiz your tomatoes and cucumber in a blender with some sweet red peppers, onion, and garlic and you've turned them into Quick & Easy Gazpacho, a healthy and refreshing chilled vegetable soup. 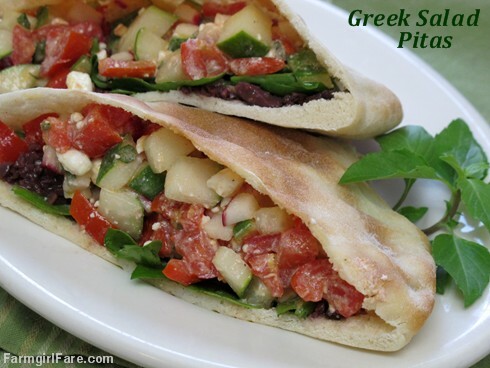 Or you can stuff some Greek salad into pita bread and have a delicious light supper or lunch. Using baby spinach instead of lettuce adds extra flavor and nutrients, and the radishes offer a nice zippy crunch, but it's the quick and easy kalamata olive tapenade that really makes these sandwiches shine. Keep some on hand in the fridge, along with pita breads in the freezer (they defrost at room temperature in just a couple of minutes), and you'll be able to whip up lunch or a light supper in no time. These sandwiches are also perfect for taking to work or on a picnic. Just pack the ingredients separately and assemble them right before eating so they don't get soggy. As always I urge you to seek out local and organic ingredients; they really do make a difference. Homegrown Greek oregano is a low maintenance, inexpensive gourmet treat. I've been harvesting from the same plant for years. To seed your tomatoes, simply cut them in half and gently squeeze out the seeds. To make the tapenade, put the garlic in a food processor and process until chopped. Add the olives, olive oil, and vinegar and process until spreadable but not completely smooth. Note: This is a small amount of tapenade, so I use the handy little inset bowl in my 12-cup KitchenAid food processor. A mini food processor would work well too. To make the salad, combine the cucumber, tomatoes, feta, and radishes in a large bowl. Add the olive oil, vinegar, oregano, and several grinds of pepper and toss to combine. If your feta isn't very salty, you may want to add a little salt to taste. Slice the pitas in half and open the pockets. Divide the tapenade among the pitas, spreading it evenly inside each. Stuff each pita half with about 1/2 cup of the spinach and 1/2 cup of the salad mixture and serve. Nothing tastes better than homemade pita bread, and you can make your own in about an hour. And if some of your pitas don't puff and won't split? Simply pile all the salad stuff on top (or make pita chips and pita pizzas). © FarmgirlFare.com, always cool as a cucumber. Okay, maybe not always. This post reminds me to thank you for your pita bread recipe and instructions. Years ago, when I had young children and baked three loaves of sourdough a week, I tried my hand at pitas a few times, with less than stellar results. Tasty, but not pitas, so I just kind of gave up on the idea. A year or so ago, I decided to try again, and your recipe was my main source. You gave great clear instructions and a good recipe. I make your pitas regularly now, and we all enjoy them immensely. Thanks so much for your good work! I am also a huge fan of your oatmeal bread recipe. It's always a hit, too. Soooo...three out of three recipes I've tried out on your site has turned out spectacular. This recipe was the latest one. I will make it again next summer, when tomatoes are at their peak. But until then... yum!